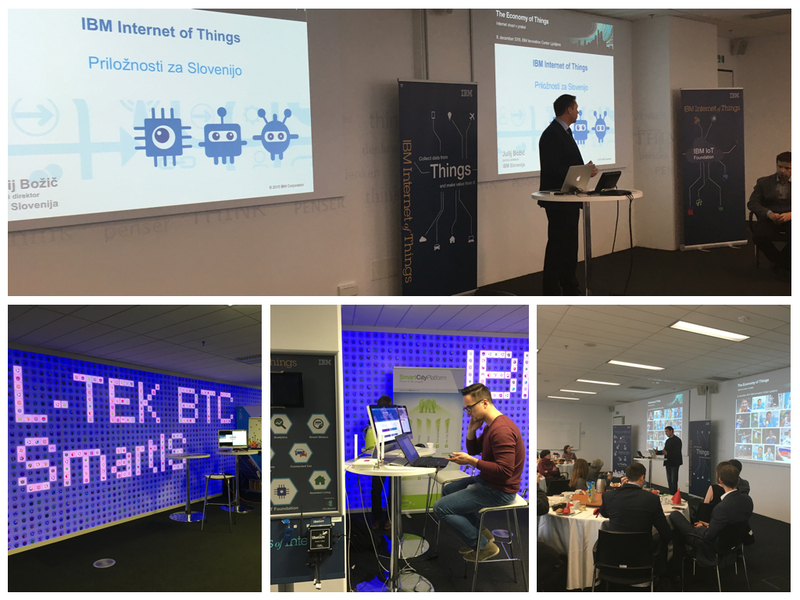 Last 8th December, The Economy of Things, an IoT event, took place at the IBM Innovation Center in Ljubljana. It gathered about 60 attendees from different fields, for example people who come in representation of industry, cities, municipalities or architecture among others. There, the IBM strategy in the IoT was presented with its IBM IoT solution for Industries. The aim of this business initiative is to demonstrate the importance and the implementation of tools to measure several daily life aspects in a smart city (water consumption, energy efficiency, flow of people and traffic…) in order to optimise and take the best corrective actions. For this event Smartis, an inminent partner of Libelium in that geographical area, prepared some equipment provided by us and in wich they have technical knowledge. For that, Libelium sent temperature, humidity, noise and air quality (NO2, CO y CH4) sensors. They transmit data to a Gateway Meshlium through 802.15.4, wich has a connecting agent that can export this information directly to an IBM Bluemix platform. From Libelium, we expect a lot of this three-way relationship. In addition, Smartis presented its SmartCity Platform. The main objective is to give support to the city leaders in order to exploit the full potential of the cities. In this sense, what they are looking for is to improve the city efficiency and their citizens´ satisfaction. The SmartCity Platform has different branches based on data collection in order to drive the urban, social, economic and technological development.